Nigeria’s finance minister, Kemi Adeosun, has issued a new set of guidelines to compel federal government offices remit monies they generate, accompanying the stringent rules with the threat of sanctions to defaulters. Henceforth, the minister said, all self-funded federal agencies are to limit their annual expenditures from their internally generated revenues to not more than 75 per cent of their total gross revenue, while fully funded agencies must remit all monies they generate to the Consolidated Revenue Fund, which is the federal government’s central account. The move is aimed at recouping billions of naira wasted annually by hundreds of government agencies who generate revenues, but fail to pay same to the government, despite having all their administrative costs covered for by the federal budget. Such agencies do not account to the government regardless of how much they generate, in violation of the Fiscal Responsibility Act, 2007. The Act stipulates that revenue-generating establishments pay up to 80 per cent of their operating surplus into the government coffers. In past years, impunity reigned as ministries, departments and agencies refused to comply even as government’s revenue declined. The Fiscal Responsibility Commission, set up under the 2007 Act, had always complained that key government agencies brazenly spent the billions they generated each year. In 2014, the head of the commission’s Legal, Investigations & Enforcement Directorate, Charles Abana, told PREMIUM TIMES that some of the biggest violators of the law include the Nigerian National Petroleum Corporation, NNPC, Securities and Exchange Commission SEC, and Nigerian Port Authority, NPA. Others include the Nigerian Maritime Administration and Safety Agency, NIMASA, National Agency for Food and Drug Administration and Control NAFDAC, Joint Admissions & Matriculation Board (JAMB), Nigerian Communications Commission, NCC, Nigerian Television Authority, NTA, Corporate Affairs Commission, CAC, and National Examinations Council, NECO. Mr. Abana said these agencies adopt various “creative accounting practice schemes”, by either providing false information on revenue generated, or how much was due to government every year. He said the fraud was so extensive that each year these agencies deliberately provide contradictory financial statements and information to different supervisory or regulatory authorities, namely Finance ministry, Accountant General’s office, and the FRC, to mislead them. A new accounting guideline announced Friday by the finance minister, Mrs. Adeosun, seeks to curb the practice. 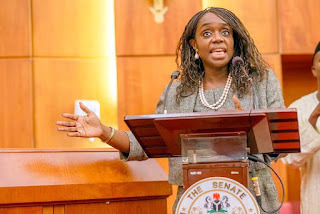 Mrs. Adeosun said in a statement that records have shown “very poor compliance with the provisions of the Fiscal Responsibility Act”. “Some agencies have never credited the Consolidated Revenue Fund, despite having salary, capital and overhead financed by the Federal Government. Indeed, cost to income rates of 99.8% have been the average, meaning that they spend all their internally generated revenue and subventions released to them,” she said. Such practices, the minister pointed out, were not sustainable under any economic circumstance. She said the current serious economic challenges Nigeria faces can no longer tolerate those practices. Under the new rules book, boards and agencies of government currently operating outside the budgetary controls are directed to strictly comply with the law by ensuring all revenues and 80 per cent of their operating surpluses are credited to the consolidated revenue fund. The minister said henceforth revenues generated by all MDAs must be reported on a gross basis prior to any deductions. She directed all self-funded federal agencies to limit their annual expenditures from their internally generated revenues, IGRs, to not more than 75 per cent of their total gross revenue, while fully funded agencies must remit all their IGR to the CRF. To ensure continual monitoring, all MDAs funded through the annual budget must submit monthly Expenditure Transcripts and Revenue Returns, to the Office of the Accountant-General of the Federation (OAGF), while other agencies must prepare and submit quarterly management accounts, including Revenue Returns to the OAGF. The minister reminded all MDAs that in line with Financial Regulations 107, the AGF shall carry out routine revenue monitoring and inspection visits to the MDAs to verify compliance with the new guidelines. She vowed sanctions for any Accounting Officer/Chief Executive Officer of MDAs who defaults in remitting the revenues as appropriate. “Renewal of the tenure of appointment of Accounting Officers/Chief Executive Officers shall be tied to their compliance with the content the new guidelines,” the minister said.